So … energetic would be a good way to describe how I felt all day … right up until about now. Lots of energy all day. Now? Exhausted. By 7:30 AM I’d unloaded and reloaded the dishwasher, put a load of laundry in both the washer and dryer, cleaned the kitchen, made the bed, packed Jon’s lunch, fed the dog, checked email and opened all of the blinds/started the day. I do this stuff just about every day … just with a lot less enthusiasm. 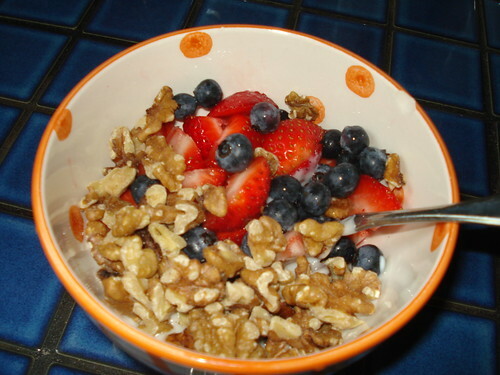 I had a light breakfast because I had a session with the trainer and can’t tolerate eating a lot prior to working out. After the trainer I had some kind of freakish burst of energy, so I stopped at home to grab a portable snack and then headed to the gym. The whole listening to my body experiment is turning into a good thing, I think. I almost didn’t go to the gym because I’d just had an hour of strength training and knew I’d have pilates tonight and wondered if adding more would be a bad idea. I felt great, though, had a ton of energy, and really wanted to do it … so I took advantage of it. Compared to Sunday – when I didn’t really want to be at the gym and had to force myself to stay on the stairmaster – it was fabulous. 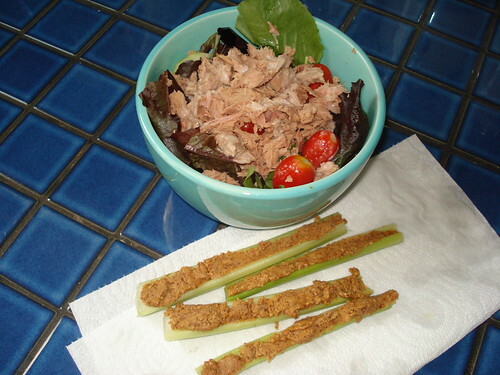 Lunch was a salad with tuna and a T of rosemary lemon dressing and 2 celery sticks (broken in half) with natural almond butter. 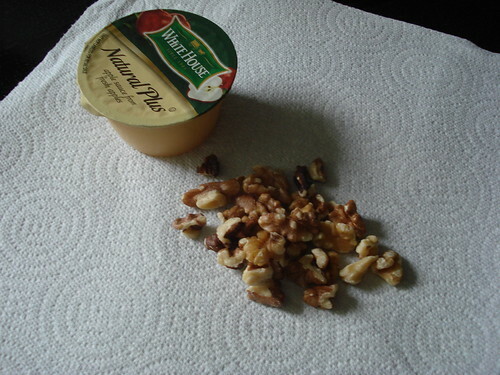 My snack this afternoon = yogurt/fruit/walnuts. 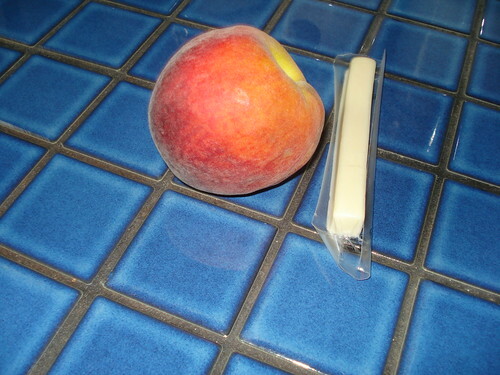 I will probably eat this every single day until the thought of it makes me sick. Seriously love it. Jon tries to convince me to eat plain yogurt because he’s a yogurt purist … and I’ve tried … even tried some of his (full fat) fage this morning. Just not happening (unless it’s homemade and less tart). I’ll eat it if I have to, and DO eat it every now and then to try to retrain my brain, but … eh. I honestly just don’t care enough to try that hard. I like vanilla yogurt and don’t think it will kill me. I work it into my day and almost always wind up below 100g of carbs. So, pilates. Love it, of course. So glad it/the trainer is back. I was sore from 2 straight days of strength training and had a hard time, though, despite using the foam roller off and on this afternoon. I just laid there through some of it and laughed at Jon’s grunting and groaning (he’s sore from lifting) and thought about how lucky I am to be married to someone who’s in this with me and is 100% supportive. 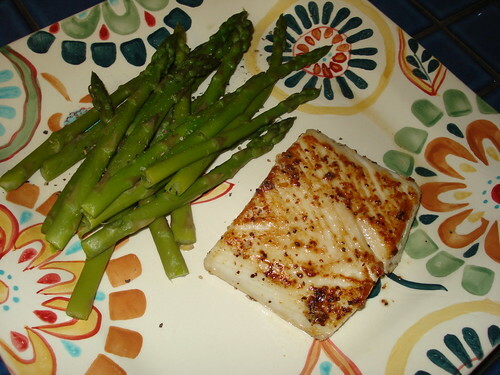 Dinner tonight (cooked by Jon, of course) was mahi mahi with some lemon pepper sprinkled on top and steamed asparagus. I’m exhausted and going to bed after I eat a small snack (likely a cheese stick) to bring my calories up from 1,399 for the day and spend maybe 10 more minutes on the foam roller. I hope I can walk tomorrow.